The bar was three rows deep with pill box hats and slingback heels. On September 26, 1949, a platoon of women elbowed their way into the Roosevelt Hotel, that grand white beast just south of Canal, in pursuit of equal rights and the best drinks in town. They found both at the Sazerac Bar. The art deco bar, with its handsome walnut walls and iconic Paul Ninas murals, was a mainstay for business types and politicians. A men’s only joint. Mardi Gras was the only day women were allowed inside. They had earned the right to vote nearly thirty years before, but women hadn’t yet fully made their way past the velvet ropes of the many de facto boy’s clubs across the country. The Sazerac included. In truth, the “Storming of the Sazerac,” as it became known, wasn’t exactly a victory for the feminist movement in the traditional sense. Seymour Weiss, the renowned showman and owner of the Roosevelt, was the real architect behind “the Storm.” Weiss was aiming less for a political statement than he was fodder for the morning papers. It was progressive seeming, yes, but it was always planned. Following his recent move of the first Sazerac outpost to his hotel, Weiss decided the bar would operate differently from here on out. The new Sazerac would be open to women. The hotelier knew how to spark publicity fire. Word made its way to the attractive counter girls working at the Godchaux nearby that the Sazerac’s doors were open to them. They came in droves on a Monday, camera-ready, with their nipped waists and feathered caps. They came in droves on a Monday, camera-ready, with their nipped waists and feathered caps. They stood at the bar, gloves wrapped about glasses filled with the bar’s namesake cocktail, a New Orleans original. They, just like the men, craved the drink invented by a local apothecary, Antoine Peychaud, over one hundred years ago. And they wanted it at the Sazerac. Liberation never looked so elegant–or tasted so good. Even if the women didn’t break down the doors of the Sazerac entirely of their own accord, they became a wider symbol of changes afoot. The images that circulated showed women in a space previously closed off to them. Doors elsewhere would open to others because of it. 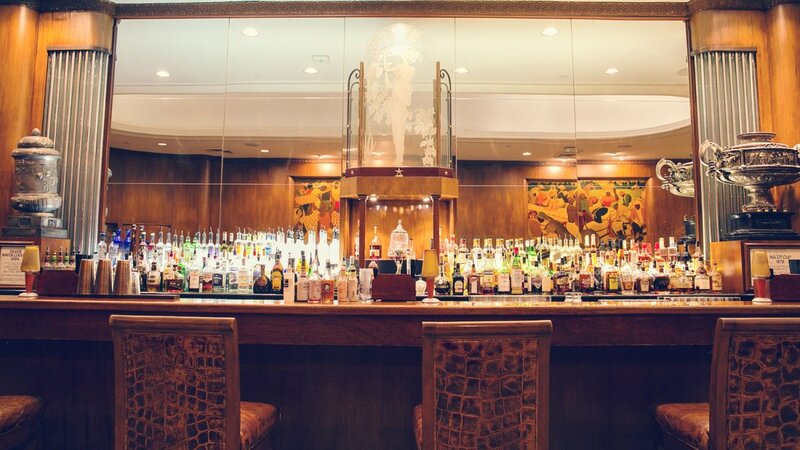 The Roosevelt Hotel exists today in all its historic grandeur, as does the Sazerac Bar. Its eponymous cocktail is still made, that New Orleans original brew of French brandy and Peychaud’s Bitters. Every September, ladies recreate the scene, trading in their sneakers and jeans for furs and pearls, if just for a night.